Our next production, The Servant of Two Masters, premieres this July at La Mama as part of the VCE Theatre Studies Playlist. To help us raise funds for this production we are holding a special performance of our hit touring production of 2015, Venice In Love at La Mama Carlton. The performance will be followed in the afternoon by an Introduction to Commedia Dell’Arte workshop for Teachers and Actors. We hope you can join us for some interactive and hilarious fun. 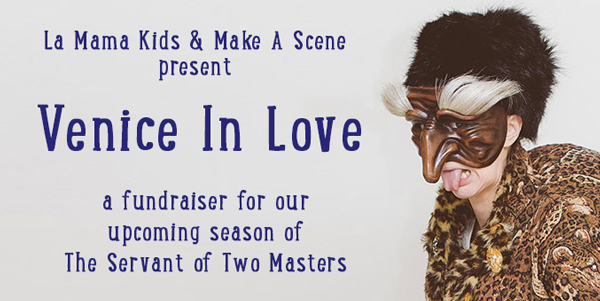 * This is a fundraising event for our VCE Playlist Season of ‘The Servant of Two Masters’ @ La Mama (13-31st July). This program is designed for theatre educators and actors to experience this exciting and stylised Italian theatrical tradition. Participants will immerse themselves in the imaginative world of commedia by experimenting with masks, improvisation, voice, movement and script. Participants will place this style of theatre in a relevant cultural and historical context. Discover the importance of ‘play’ and improvisation as an essential skill for actors and all performance styles. Analyse and play with the various traditional leather commedia masks and stock characters. Transfer commedia techniques and conventions to other performance styles.